Sometimes my roommate has trouble making decisions. Not on big, important things, at least I don't think so. He merely...gets bogged down in particulars? So it's often easier to just make a decision for him. Note that I do not enjoy doing this. Especially not about birthday cakes. How can one not care what kind of cake they have?! "Adam. Please. What kind of cake do you want, I can make anything." Know that no one ever asks for anything out of the ordinary, but I can always hope. "Okay, I want Red Velvet," he says emphatically. "Ugh, fine, I'll do it. But I'm going to use beets instead of food coloring." He looked somewhat taken aback, but didn't object. So there was indeed a way to make this cake out of the ordinary. It wasn't horrible! It didn't taste like beets! If I hadn't told everyone about the beets so they could prepare themselves in case it was barfworthy, I don't think anyone would have known. It's not going to be as shockingly red as it would be if you used dye, but it was still clearly red. Now I can make red velvet again without feeling gross. On the side note, the frosting on this was fantastic, a cream cheese Swiss meringue buttercream. Yeah, a little more complex than American buttercream/cream cheese frosting, but worth it to me. In the bowl of an electric mixer fitted with the paddle attachment, cream together butter and sugar until light and fluffy, then beat in eggs one at a time. Add beets and vanilla. In a liquid measuring cup, combine buttermilk, rice vinegar, and lemon juice. Add the dry and wet ingredients alternately to the beet mixture, making three additions of dry and two additions of wet (starting and ending with dry). Mix gently to incorporate, scraping down the bottom and sides of the bowl as needed. Pour the batter into the prepared pans Bake the cakes in the preheated 350˚F oven for 35 – 45 minutes, until a toothpick inserted in the center comes out with a few point crumbs sticking to it (start checking after about 25 minutes). Run a knife around the edge of the pan, invert the cakes onto a rack, and cool completely. So glad for everyone that this Red Velvet Cake turned out so nicely. I love the buttercream you used. 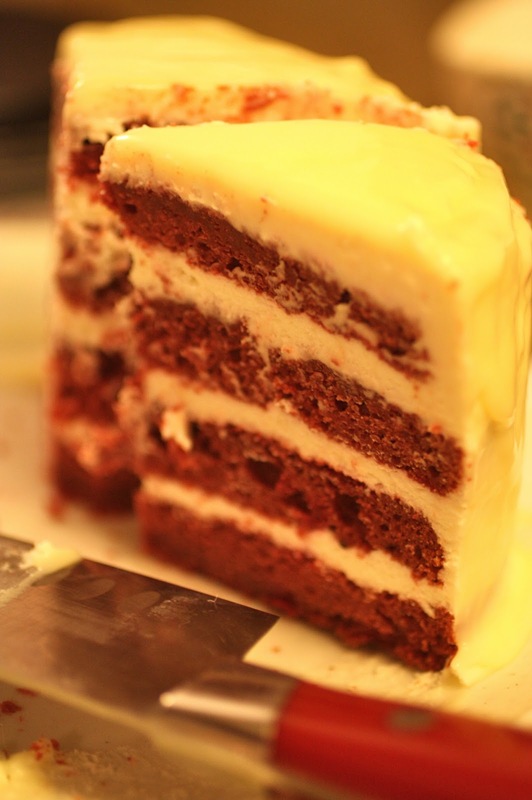 Nothing like a good red velvet cake... and this was a GREAT red velvet cake!